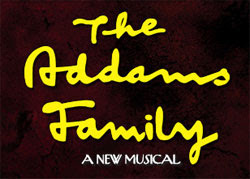 From "broadwayworld.com","THE ADDAMS FAMILY features an original story. It's every parent's nightmare. Your little girl has suddenly become a young woman, and what's worse, has fallen deliriously in love with a sweet, smart young man from a respectable family. Yes, Wednesday Addams, the ultimate princess of darkness, has a "normal" boyfriend, and for parents Gomez and Morticia, it's a shocking development that turns the Addams house upside down when they are forced to host a dinner for the young man and his parents." This show is most definitely a show to bring the whole family to! As said on www.broadway.com, "The Addams Family is perfect for kids." This show promises the whole family will have an absolutely fun night. The Addams Family is playing at the Lunt-Fontanne Theater in New York, NY. Visa, MasterCard, and American Express are accepted here. The Theater would like to warn that only the Box Office, Ticketmaster, and Ticketmaster.com are authorized to sell tickets to this event and that any tickets purchased any where else will not be accepted.